Updated Monday, Dec. 11, 2017, 10:50 a.m. EST: The NYPD has a suspect in the blast that disrupted midtown Manhattan on Monday morning. As the New York Times reports, Akayed Ullah, a 27-year-old from the city’s Brooklyn borough, is believed to have detonated an explosive device while walking in an underground passageway that connects the Times Square and Port Authority subway stations. He was in police custody and in serious condition at New York’s Bellevue Hospital Center. The NYPD says that Ullah operated alone and that the explosive device he was wearing went off prematurely. The New York Post reports that Ullah had what appeared to be a suicide vest, with “wires attached to him and a 5-inch metal pipe bomb and battery pack strapped to his midsection.” A city official told the Times that the blast was caught on video. The city’s Fire Department has reported four injuries from the blast Monday morning. Updated Monday, Dec. 11, 2017, 8:56 a.m. EST: Police have confirmed to the New York Daily News that a suspect is now in custody in an explosion that went off during the morning commute in midtown Manhattan Monday. 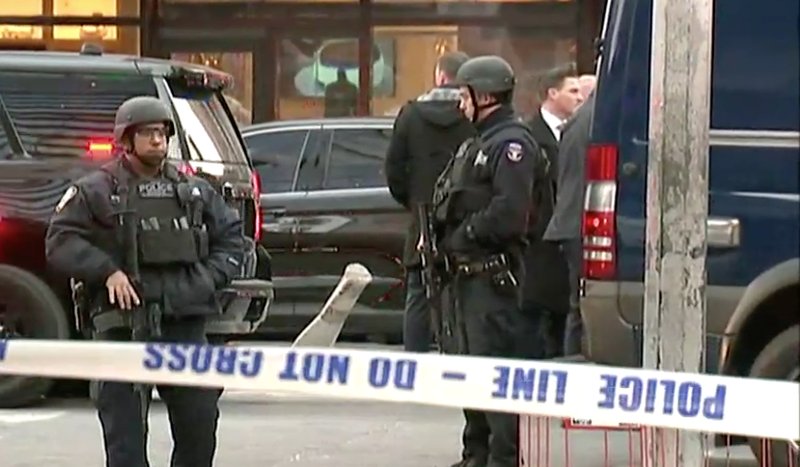 So far, the blast, which occurred in an subway passage near the Port Authority Bus Terminal about 200 feet from West 42nd Street and Eighth Avenue, appears minor. No structural damage has been found, and no other injured persons have been confirmed. The New York City Police Department is investigating an explosion in midtown Manhattan Monday morning. The explosion occurred below the New York Port Authority Bus Terminal, at 42nd Street and Eighth Avenue. Police, firefighters and EMT personnel have flooded the area, and scenes of the investigation are being posted on social media accounts. One video appears to show a man with a vest that explodes as he is walking through one of the Port Authority tunnels. CBS News, per a law enforcement official, is reporting that a “possible pipe bomb” went off in a subway tunnel. According to its source, one person is in custody, with additional reports of injuries beginning to trickle in. The Port Authority terminal is being closed off. Law enforcement has evacuated the A, C, and E subway lines as a precaution. Other trains are continuing to run throughout the city.